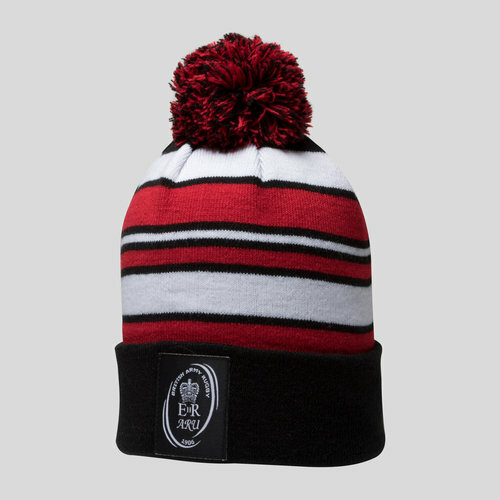 Prove your affiliation lays with the Army Rugby team when you pull on in the cold this Army Rugby Union Striped Bobble Hat from Samurai in Black, Red and White. This stylish bobble hat from the Army Rugby Union side has been made by Samurai with an impressive white, black and red striped design which will stand out in the crowd when you're supporting the boys. The black turnover hem features Samurai badge and the ARU logo on the front and back, respectively. The beanie utilises an acrylic knitted fabric which not only keeps your head warm in cold conditions but also ensures your head doesn't overheat and cause discomfort.